On Friday, Rona Griffin, 52, pleaded guilty to 17 counts of preparing fraudulent taxes and failing to pay her own taxes. She is expected to receive nearly four years in prison when she is sentencedMarch 28. “We are satisfied that Ms. Griffin finally understood the damage she did to her clients and how wrong she was to cheat the state,” Hennepin County Attorney Mike Freeman said. Through Griffin’s fraud, at first from her home in Champlin and then Minneapolis, she was accused of costing the state more than $1.6 million in tax revenue between 2009 and 2013. Read more. 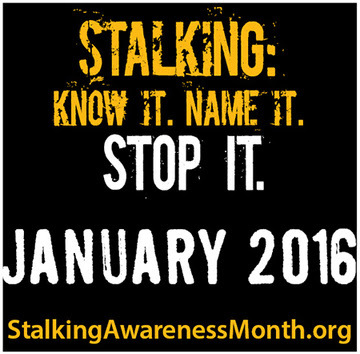 Stalking is a crime in all 50 states and yet many victims and criminal justice professionals underestimate its seriousness and impact. It affects 7.5 million people each year. Unfortunately, it is difficult to recognize, investigate, and prosecute. Unlike other crimes, stalking is not a single, easily identifiable crime but a series of acts, a course of conduct directed at a specific person that would cause that person fear. Stalking may take many forms, such as assaults, threats, vandalism, burglary, as well as unwanted cards, calls, gifts, or visits. Victims may suffer anxiety, social dysfunction, and severe depression at much higher rates than the general population, and many lose time from work or have to move as a result of their victimization. For more info. visit http://www.justice.gov/ovw/stalking. Reggie Harper, 24, of Brooklyn Park, recently pleaded guilty to second-degree intentional murder in the death of his 23-month-old son Kazerion on Dec. 9, 2014. In exchange, a first-degree murder charge was dropped by prosecutors. Harper will spend 40 years in prison. The baby’s mother and grandmother both gave emotional victim impact statements. The mother said that Harper had inflicted mental, emotional and physical abuse upon her and because of the murder, she lost her parental rights to Kazerion’s older brother. During his guilty plea, Harper admitted that the baby was making noise and he assaulted his son. The criminal complaint indicates that the baby was crying and he would not allow the mother to tend to him. Instead, he put Kazerion on the floor and punched him repeatedly and threatened to hurt mom if she interfered. By the time paramedics arrived, Harper had fled. The baby was pronounced dead at the hospital. Harper also admitted to the aggravating circumstances in the crime that allowed the judge to raise the prison sentence from the guidelines of 306 months to the 480 sentence he received, which is the maximum allowed under law. Those aggravating circumstances were that Harper was the boy’s father, that the victim was an infant, the cruel manner in which he was killed and that it happened in the boy’s home, which is considered a safe zone.